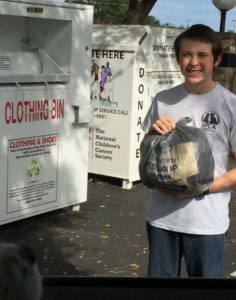 The STEM/Science Club at FLVS recently participated in a clothing drive. Sometimes it can be easy to take something as simple as the clothes on our back for granted. The STEM club members did an awesome job helping out those in need! 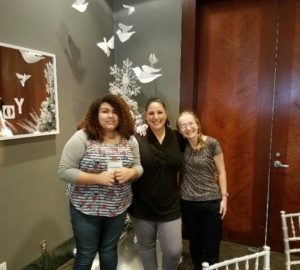 Last December, the FLVS Student Ambassadors helped out at the Orlando Museum of Art Christmas Tree Celebration. They volunteered to help with the Senior Day festivities, where there were over 10,000 guests. The students worked in the café and welcomed all of the guests that attended. And it’s not only our FLVS students that show kindness to their communities! 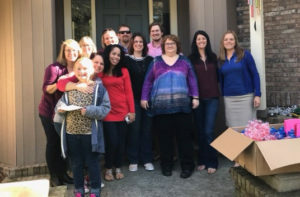 A strong emotional connection binds FLVS teachers with the families living at the Ronald McDonald House. One of us pictured below has a son who battled leukemia as a toddler, and one of us currently has a cousin battling leukemia. In addition, one of us lost a dear friend who lost her battle with that same illness. While leukemia may not touch each of our lives directly, we can all empathize with what the families at the Ronald McDonald House must endure on a daily basis. You see mothers and fathers who are tired, tearful, and worn out, but also hopeful and thankful. 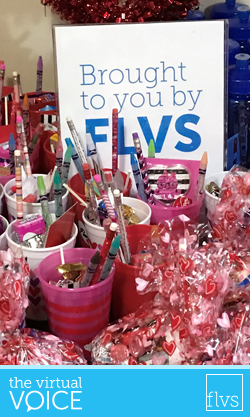 A week before the event, FLVS teachers and staff met at Marie Mitchell’s home and assembled goody bags, treat cups, and water bottles. One teacher also donated new stuffed animals to pass out. Upon arrival to the Ronald McDonald House to deliver all of the goodies, we were met by children who are battling cancer and their families. When they followed us into the kitchen and realized they could choose various Valentine’s treats, pick a stuffed animal, and eat freshly baked cookies, they were overjoyed. One student spent the entire evening with us, excited to know that FLVS would provide him with the courses he needed to complete middle school. That ray of hope he felt when he realized that he might one day graduate with his friends encapsulates why we all love FLVS and giving back to our community. For one night, the children and their families at the Ronald McDonald House enjoyed some delicious baked cookies, hugged a stuffed animal, and forgot they were cancer patients. We left with joy in our hearts. And all of this just in time to celebrate National Random Acts of Kindness Day! Tell us how your giving back and sharing the love in the comments below. This entry was posted in Educator Edition, Homeschool Edition, Parent Edition, Student Edition and tagged Community, Community Involvement, Community Service, FLVS Clubs, Giving Back, Kindness, Making a Difference, Passion Projects, Random Acts of Kindness, Student Activities, Student Clubs, Teachers, Thankfulness, Valentine's Day, Volunteering on February 17, 2017 by Guest Blogger.